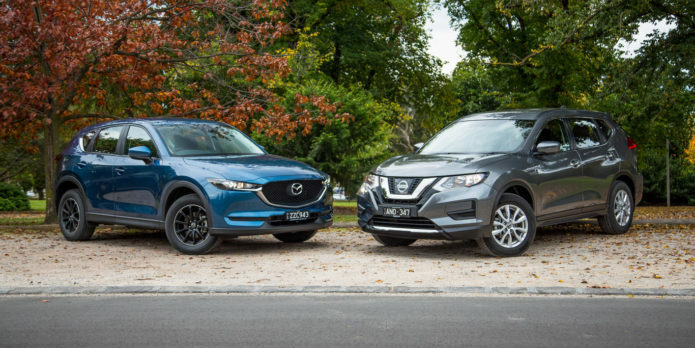 You’re looking at two of the most popular and recognisable SUVs on the market, the just-launched second-generation Mazda CX-5 and the newly updated Series II Nissan X-Trail. Both Japanese offerings have found tens of thousands of buyers in Australia over multiple generations, albeit for different reasons. The Mazda has always blended semi-premium design and handling characteristics with mass-market affordability, while the Nissan has long been about maximising practically and family-friendliness in a rather boring package. Yet both are chasing the same type of buyer, from the broad cross-section of society that has propelled the so-called medium SUV segment into market supremacy. Here we’re looking at each in their latest iterations, tested in their most affordable front-wheel drive forms, called the CX-5 Maxx and X-Trail ST.
Because of this, we’re looking particularly for which car best balances a decent equipment list with maximum practicality and space, since the target buyer is practicality-minded, logical and seeking an SUV that’s fit-for-purpose. We’ve done many medium SUV tests with highly specified vehicles, in order to show you the widest array of available features possible. But for many family buyers on a tight budget, a price under $35k is essential. There’s nothing in it with this pair. The Nissan is $30,490 before on-road costs, with Mazda $200 more. There’s a fair bit of equipment commonality. Both get safety features such as six airbags, autonomous emergency braking (AEB), rear-view camera and ISOFIX anchors for child seats. Each has a fairly modest array of features as befits their entry level status, though the essentials are there: cloth seats, cruise control, manual air conditioning, Bluetooth/USB, push-button start and LED tail-lights. Neither has Apple CarPlay or Android Auto, which is a miss. Differentiating each, the Nissan alone has daytime running lights, alloy wheels, rear air vents, forward collision alert and keyless entry. But the Mazda counters with a larger infotainment screen (7.0-inch versus 5.0-inch), digital radio, LED headlights, blind-spot monitoring and rear cross-traffic alert. Our test Mazda was also fitted with $1400 worth of satin black alloy wheels and a $702 satellite navigation SD card. It’s tough to split the pair, though there’s probably a more solid case for the Mazda by the skin of its teeth. You can make an argument the other way. The Nissan X-Trail ST’s cabin didn’t change a whole lot with the MY17 update, though importantly the company fitted a much nicer steering wheel and gear shifter, new vent finishes, and a softer console cover that doubles as an armrest. Nissan has efficiently improved most of the cabin’s main contact points and added a new layer of prestige to what otherwise remains a serviceable layout, with decent ergonomics and flawless build quality. There’s ample cabin storage pockets in the doors, the roof and between the passengers, simple to operate ventilation controls and trip computer, and the large windows and high seating position give passengers good visibility. The biggest gripe is the tiny 5.0-inch screen which requires fiddly button operation – though the Bluetooth at least re-pairs well enough – and is thoroughly outdated. We also dislike the clumsy foot-operated parking brake and the woeful, tiny rear-view camera display. The new-generation Mazda CX-5 certainly beats out the Nissan in terms of design appeal, with the typical Mazda tablet touchscreen operated by a BMW-style rotary dial (and the option of sat-nav), nicer dials and switches, more contrasting materials and a slicker electric parking brake. Even in this low-equipment form the CX-5 feels like a car that offers style with substance, as opposed to the by-the-numbers Nissan. The Mazda also offers better audio quality and an extra USB point. There’s no digital speedo unlike the Nissan however, which will annoy many given the intense policing of speed here. The tables turn in the rear. The Nissan back seats get separate air vents unlike the Mazda, and while the bases are flat and excessively high, outward visibility and ingress/egress is superior. The Nissan’s back seats also slide on rails and offer superior headroom and knee room to the CX-5, which is tight for the class despite offering superior seat pitch and better-positioned grab handles. Once again, the Nissan is all about basic competence, whereas the Mazda makes some compromises in order to boost design. There’s only a 5mm wheelbase difference, so there’s no reason for any packaging inferiority. The Nissan also offers 22 per cent more cargo storage with five seats in use, 565 litres compared to 442L. The Mazda’s seats fold 40:20:40 compared to 60:40 for the Nissan, though the latter has a through-loading ‘ski port’. The X-Trail also has a larger, longer storage area with the back seats folded, and while the floor is hard-wearing carpet the side panels are tough plastic, and there’s a handy water-resistant cubby underneath said floor, for wetsuits and towels. Finally, for an extra $1500 you can buy the Nissan X-Trail ST with seven seats, something few rivals (the Mitsubishi Outlander comes to mind) offer. Big tick. The Mazda offers a greater degree of ambience thanks to extensive carpeting and a superior cargo blind, though annoyingly it lacks the seat-flipping levers in the cargo space found on the Maxx Sport spec and above. In short, the Mazda’s cabin has more design appeal but the Nissan offers superior space and versatility. Based on what we’re looking for, the Nissan edges it. Both vehicles here come with more efficient, city friendly front-wheel drive configurations, though both can be had in on-demand all-wheel drive form (AWD) for those who want the surety – at a price impost of $2000 for the Nissan and $3000 for the Mazda. The Mazda CX-5 Maxx gets a smaller engine than its higher-priced brethren – an unchanged 2.0-litre high-compression petrol unit making 114kW of power at 6000rpm and 200Nm at 4000rpm. It’s matched to a six-speed automatic with a torque converter. The Nissan X-Trail ST has an aged but proven 2.5-litre petrol engine with a superior 126kW of power at 6000rpm and 226Nm of torque at a higher 4400rpm, matched to an efficiency-boosting but fun-sucking continuously variable transmission (CVT). Given the 1490kg (tare) Mazda also weighs 32kg more than the Nissan, you’d expect the latter to offer notably better performance, though it’s not so. The Mazda’s little engine revs freely and happily, and is matched to an excellent transmission that squeezes the most from it, while injecting some character. The Nissan’s unit feels stronger across more engine speeds, though the CVT’s familiar droning note (a common symptom of infinitely variable ‘boxes) can get dreary under heavy throttle. Neither is a speed machine, but both are perfectly happy sitting at well under 2000rpm at 110km/h, or punting about town. Even loaded up and sent up hills they’re competent enough for the task at hand, given neither is designed to be driven hard. Claimed fuel economy is 6.9L/100km for the Mazda and 7.9L/100km for the Nissan. Our test yielded respective returns of 7.9L/100km and 9.4L/100km, giving the CX-5 the clear edge in economy terms, despite its engine having to work harder. On paper it’s the Nissan, but in reality the Mazda has a slightly superior drivetrain with all factors considered. We’re not disconnected enough from reality to expect either of these offerings to be sporty cars. We want maximum ride comfort and quietude, with safe and predictable handling. Both the Mazda and Nissan have independent suspension at both ends, and both wear 225/65 tyres mounted to 17-inch wheels (the standard CX-5 Maxx has steelies with plastic covers, unlike the optioned-up car we have on test). The Nissan has never been a dynamic benchmark, though we found its bump suppression fairly good. The suspension is soft but it settles sufficiency quickly on recovery, and while there’s a little body roll it doesn’t wallow about. It also has an additional 17mm of ground clearance over the Mazda to make steep driveways and the like simpler. The electric-assisted steering is very light which is excellent for urban conditions, though a little more loading-up at speed wouldn’t hurt. Nissan has also fitted brake torque-vectoring to minimise understeer, and added noise-deadening materials to improve cabin refinement. The latter is particularly noticeable. The Mazda offers a little more ‘zoom zoom’ as befits its brand, with greater steering resistance, and a slightly firmer ride that sharpens up body control-handling without ever making the car needlessly harsh or jittery. Mazda has also made some strides in noise suppression in this generation, and the G-Vectoring system improves cornering sharpness not by braking the inside wheel but by cutting engine torque delivery to the front in response to steering inputs, transferring the body weight forwards to imitate throttle lift. The benefits are subtle but there. It’s clear that the Mazda is a more fun drive, though the Nissan’s breezier steering, superior outward visibility and improved NVH make it an amenable family runabout. At a $50k price point the differences would be more important to a verdict than here. From an ownership angle, Nissan gives you a three-year/100,000km factory warranty with roadside assistance across the tenure. Nissan also offers advertised servicing prices at intervals of 12 months or 10,000km (whichever comes first). The base cost of the first five visits is $232, $339, $232, $429 and $232 for a total of $1464. Mazda gives you a three-year/unlimited km factory warranty with extra-cost roadside assistance across the tenure (from $68.10 annually). Service intervals are the same 12 months or 10,000km as the Nissan. The base cost of the first five visits is $300, $328, $300, $328 and $300. That’s a total of $1556 plus some incidentals. There’s really bugger-all in it then. Neither should cause you much trouble. You could mount a solid argument to buy either of these vehicles if you want a sub-$35k family crossover. The Mazda CX-5 Maxx will look more appealing in the driveway thanks to more exciting styling, has a more resolved cabin look and feel and a few extra modern preventative safety features. The Nissan counters with superior cabin practicality and space, a few unique features of its own, and counters its inferior fuel economy with more power. Ticks for the seven-seat option too. Yours truly would take the Mazda, but against our weighted metrics the Nissan takes the edge. In higher equipment grades we know that the tables would turn, but down here the X-Trail is in its element.